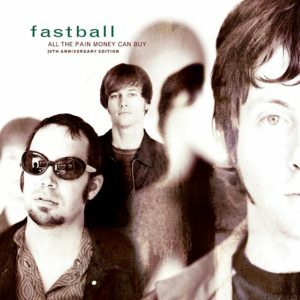 The sophomore record from the Texas-based Power Pop band Fastball is likely remembered by most for the lead track and ultimate earworm “The Way.” The ridiculously catchy song about an old couple who goes out for a drive and gets lost forever, was endearing for the first few weeks of it’s release… but seven weeks in, the amount of time it spent on Billboard’s Modern Rock chart, it had more than worn out it’s welcome. Which is a shame for the band, because the album, “All The Pain Money Can Buy,” listened to with fresh ears, is remarkably impressive from start to finish. And Omnivore Recordings, keeper of the Power Pop flame, is ensuring the record gets it’s due with a proper 20th anniversary re-release – including its debut on vinyl. The band may have been a victim of their own success wearing out their welcome before many had a chance to listen to the complete LP – one that happens to be a nearly flawless collection. The CD version of the album – which also boasts the impossibly catchy singles “Fire Escape” and “Out of My Head” – includes nine bonus tracks. The add-ons are various demos (four of which have never been released before), several B-Sides and songs from random compilations. Appropriately enough, the closing track on this set is a simply divine acoustic version of “The Way,” reframing and refreshing the song for a whole new decade.